Chemists have always had theories to explain and predict chemical properties, interactions, and reactions: steric effect, electronic effect, Van der Waals interaction, Transition State theory, etc. With the continuing rapid growth of computing power (one of the latest developments being IBM's Blue Gene project), and software algorithms for computational chemistry (Pople's and Kohn's contributions, for instance, resulting in a Nobel prize), it has become not only possible, but also practical to apply these theories quantitatively by implementing them as mathematical computer models with Computational Chemistry. Computational Chemistry complements the traditional scientific methods: observation and experimentation. It can sometimes provide the same data as an experiment, but the most effective use of Molecular Modeling is when information is required about a chemical or chemical process at the molecular level, that can only be studied indirectly by traditional methods. ". 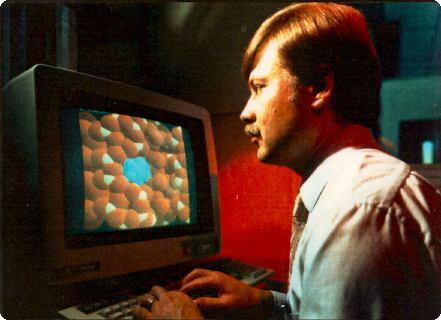 . . computer aided chemistry will be the most important technological development in the next half century. " - Mary Good, past president of the American Chemical Society, VP of R&D for Allied Signal, and US Commerce Department Undersecretary of Technology. Almost every element of the Periodic Table can be modeled with at least one theoretical method. No single Force Field, SemiEmpirical Parameterization, or Quantum Mechanical Basis Set has been developed that can handle all molecules, however, and each method has its strengths and weaknesses. Different problems require the use of different computational tools. Excellent books (by Young and by Cramer, for instance) are available for the new modeler to learn about the methods and the considerations in applying them practically. Chamot Labs has the experience, judgement, and expertise to: define an effective computational strategy to address the problem at hand, choose the appropriate computational method, recommend software, and balance chemical research requirements with practical limitations in computing resources.